The Coosa chiefdom was a powerful Native American paramount chiefdom near what are now Gordon and Murray counties in Georgia, in the United States. It was inhabited from about 1400 until about 1600, and dominated several smaller chiefdoms. The total population of Coosa's area of influence, reaching into present-day Tennessee and Alabama, has been estimated at 50,000. Hernando de Soto and his conquistadors visited Coosa on their expedition through the Southeast United States in 1539–1541. The conquistadors recorded descriptions and impressions of the various chiefdoms they visited, describing Coosa as a series of communities and fertile gardens containing much food, rather than a town or city. Coosa was also the name of one of the four mother towns of the Muscogee Creek confederacy. The Coosa chiefdom was centered along the Coosawattee River in present-day Gordon and Murray counties in northwestern Georgia. The capital of Coosa, as a modern archaeological site it is known as "Little Egypt", had a large plaza and three platform mounds, as well as residential dwellings. 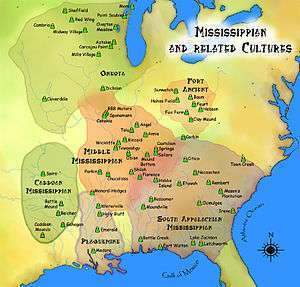 Researchers have found various Mississippian culture pottery types, the most substantial of which reflect the site's Middle and Late South Appalachinian Mississippian culture(a regional variation of the Mississippian culture) habitation from 1300 to 1600. Archeologists have defined these as the Dallas, Lamar, and Mouse Creek phases of pottery. These type variations could indicate that the chiefdom underwent three archaeological phases and changes in culture, each with distinct pottery and artifact styles. Only one other village had a mound; the others associated with the chiefdom had only residential dwellings. Hernando de Soto and his expedition entered the Coosa chiefdom in 1540. Chroniclers recorded that the chiefdom then consisted of eight villages. Archaeologists have identified the remains of seven of these, including the capital. The population of the Coosa is thought to have been between about 2,500 to 4,650 people. The chief of Coosa ruled over a significantly wider confederation of other chiefdoms, whose territory spread 400 miles along the Appalachian Mountains across northern Georgia into eastern Tennessee and central Alabama, and whose populations totaled in the tens of thousands. This "paramount chiefdom consisted of seven or more smaller chiefdoms, representing about 50,000 people." Following contact with Europeans and the associated introduction of Old World diseases, the populations of the Coosa and other local chiefdoms suffered extensive fatalities; the societies went into precipitous decline. By the close of the 16th century, most of the core area of the Coosa was abandoned. The surviving population withdrew to a few villages along the Coosa River in Alabama. Northern Georgia was occupied by the Cherokee in the early 18th century, but later abandoned. During the French and Indian War (also known as the Seven Years' War), a contingent of Muskogee under a chief named The Mortar reoccupied the site in 1759 in support of Ostenaco and the other pro-French Cherokee. By the mid-1780s, the site was occupied by Cherokee. The chroniclers of the de Soto Expedition recorded the name of the Coosa as Coça. This Old Spanish spelling would be pronounced today as "Koo-sha." The early French maps recorded several member towns of the Creek Confederacy as being occupied by the Cousha or Coushetta, in their transliterated form of the name as they heard it. The Cherokee first appeared to use the word kusa to mean the Creek people of the Upper Towns, who were competitors and enemies. According to James Mooney, they called the Muskogee Creek "Ani'-Ku'sa or Ani'-Gu'sa, from Kusa, their principal town". English speakers adopted "Coosa" as a frontier English version of the early Cherokee word. The contemporary Cherokee name for all Creek Indians is ani-kusa. 1 2 3 4 5 "Late Prehistoric/Early Historic Chiefdoms (ca. A.D. 1300-1850)". New Georgia Encyclopedia. Retrieved July 22, 2010. ↑ Charles Hudson (1998). Knights of Spain, Warriors of the Sun: Hernando de Soto and the South's Ancient Chiefdoms. University of Georgia Press. ISBN 978-0-8203-2062-5. ↑ Charles Hudson (Winter 1988). "A Spanish-Coosa Alliance in Sixteenth-Century North Georgia". The Georgia Historical Quarterly. 72 (4): 599–626. doi:10.2307/40581893 (inactive 2015-02-28). JSTOR 40581893. ↑ Isham, Theodore and Blue Clark. "Creek (Mvskoke)." Oklahoma Historical Society's Encyclopedia of Oklahoma History and Culture. Retrieved 20 Aug 2012. ↑ Wickman, Patricia Riles (1999). The Tree that Bends: Discourse, Power, and the Survival of the Maskókî People (2nd ed.). University of Alabama Press. pp. 79, 126. ISBN 978-0-8173-0966-4.